Welcome to Clay Cafe Avalon! This is our first blog post on our new-fangled website. We look forward to using our blog to keep you up-to-date on all the latest happenings at Clay Cafe. Should be fun! I often find myself lost in the moments, and memories, being made at Clay Cafe. My heart takes many more photos than I could of, over the years, of the beautiful magical moments that I wish I could frame and display in an art gallery, for all to see. Now with our new website…we can! To help you, our valued customer, navigate our new website, we thought we would point out a few new items to help you out. Firstly, you can now view (and book!) Birthday Parties, Girl’s Night Outs, and Wedding Party events online. Secondly, you can view our Art Camps and Classes online. 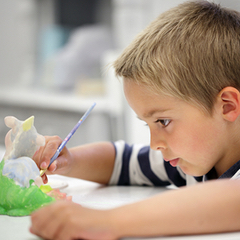 We have Child Art Classes, Adult Art Classes, and in the summertime, we have Summer Art Camps! Finally, you can also sign-up for our Kid’s Clubs on the website. We offer the following three clubs for kids: Kid’s Movie Club, Kid’s Pottery Club, and Kid’s V.I.P. Club. For those of you who already know How it Works, please feel free to explore our new website, and let us know how we can be of service. Yes, we may be a paint your own pottery studio, but we are SO much more! Because at Clay Cafe Avalon, it’s not about painting the perfect piece, it’s about painting the perfect memory!